At a memorial service for George H.W. Bush, 94, his pastor, Rev. Russell Levenson, said the former President was a "Godly man, full of grace," determined "to leave our world better than he found it. He gave me this advice: "Preach righteousness at all times, and if necessary, use words." Bush made bold decisions. At age 18 he became a Navy flyer in World War II, flying 58 missions. When shot down by the Japanese, he asked two flight comrades to parachute first. Sadly, they died, "whom he thought about throughout his entire life," recounted his son, George W. Bush at the National Cathedral. After the war Bush attended Yale, but afterwards left the comforts of the East Coast where his father was a U.S. Senator, and took his young wife, Barbara to Odessa, Texas to develop an oil business. Few know that Bush ran twice for the Senate but lost. He was a Member of Congress, however, the Ambassador to China and CIA Director. He ran against Ronald Reagan for President - and lost, but Reagan asked him to be Vice President, serving two terms. No one elected President had such a diverse and distinguished background. At the National Cathedral, historian Jon Meacham, a Pulitzer-Prize winning author and Bush's biographer, called him "America's last great soldier-statesman," and noted that under his administration, "a wall fell in Berlin, a dictator's aggression did not stand" in the Middle East. "The rest of his life was a perennial effort to prove himself worthy of his salvation - a lion who not only led us, but who loved us. That's why he was spared." Former Prime Minister Brian Mulroney of Canada recalled in his eulogy that Bush was responsible for the NAFTA trilateral trade agreement between the U.S., Canada and Mexico, (which Trump denounced). It has been newly negotiated. Mulroney outlined the President's role in reunifying Germany and his leadership in the first Gulf War. The major eulogy was delivered by his eldest son, former President George W. Bush and three granddaughters read Scriptures. On only a handful of other occasions have all living Presidents and their spouses gathered at the same place. There were a few awkward moments Wednesday. When President Trump and Melania Trump arrived belatedly, conversation in the presidential pew ceased. The Obamas offered handshakes and right-lipped smiles while Hillary Clinton, stared ahead and did not make eye contact with the man who defeated her in 2016. Bush's son patted the casket on his way to the pulpit where he described his dad as having been "born with just two settings - full throttle, then sleep," sparking laughter. He recalled that his father "valued character over pedigree and looked for the good in everyone and shared credit in victory while shouldering blame in defeat." "To us he was the brightest of 1,000 points of light," borrowing the father's signature phrase, which Trump has ridiculed. He recalled the 41st president's many hobbies - fishing, driving his speedboat and playing "speed golf" an accelerated version of the game. He noted with a laugh some of his dad's imperfections. "He wasn't exactly Fred Astaire"
on the dance floor and asserted, "The man couldn't stomach vegetables. Especially broccoli." 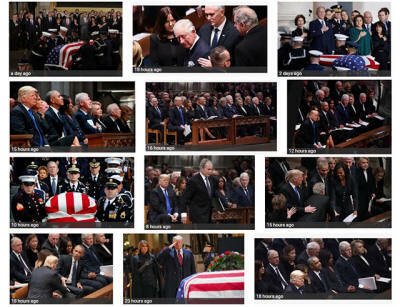 However, 43 recalled, "He showed me what it means to be a president who serves with integrity, leads with courage and acts with love in his heart for the citizens of our country." Most remarkably, Bush 41 handwrote thousands of letters to Americans at every stage of life. His son concluded his eulogy on a personal note. "Through our tears, let us know the blessings of knowing and loving you - a great and noble man, the best father a son or daughter can have - and in our grief, let us smile knowing that Dad is hugging Robin and holding Mom's hand again." As he said those words, he became tearful in referring to Barbara Bush, who died a few months ago, and their daughter, who died at the age of 3. Applause erupted in the huge cathedral as the former President, wiping tears, found his seat near Laura, his wife. Last Friday George W. Bush called his dad and was told he had only minutes to live, and told him, "Dad, I love you and you've been a wonderful father." His father responded, "I love you too." They were his last words. George H.W. Bush's example of brilliant moral leadership, integrity, and humility is inspiring in this era of Trump who sadly exhibits none of those characteristics.